Sunday morning spent drinking chai tea on the deck and watching the impressive views from the Schooner Festival on Cape Ann MA. It was a cool morning, yet, delightful after all the humid hot weather. For fleeting moments it felt the harbor was looking like it was the 19th century instead of the 21st. 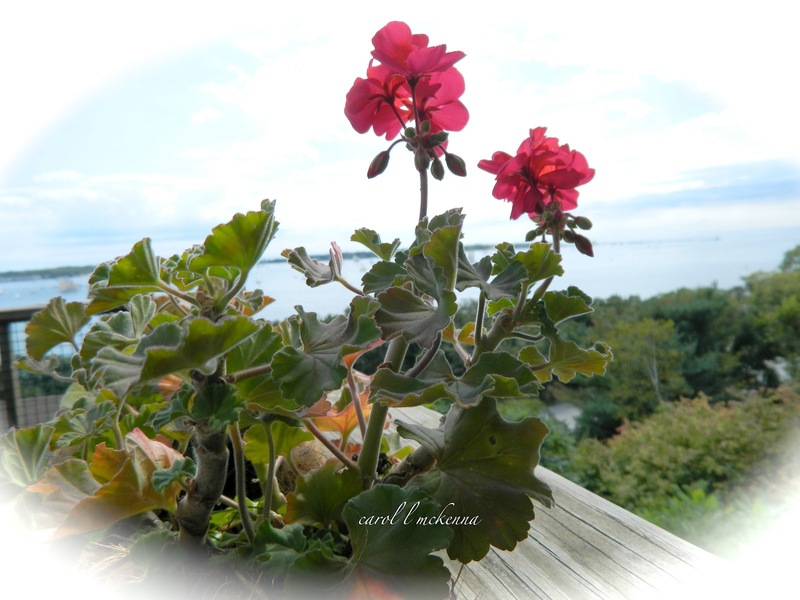 The photo below is a semi macro of my geraniums that I thought were gone for the season. The are making a come back and looking rather lovely. My weekend creativity for my spirit was focused on photography and seeing the beauty all around me. stop, change, look for good. Well, there it is. Hope you had a great weekend and wishing you a lovely and loving week. I hope you were able to calm your monkey mind...what a beautiful place you live in, I could sit there with you sipping chai and looking out over this view! Wow! What a lot of boats out there! I love the photo of the sailboats in the harbor. Just lovely. The first shot looks like a painting to me. Words and photography are wonderful. What an awesome view you have! The first shot would make a great postcard!!! The first picture makes me want to go on holidays !! What a great view you have from your deck! Gorgeous Pictures! Great blog and love the background! 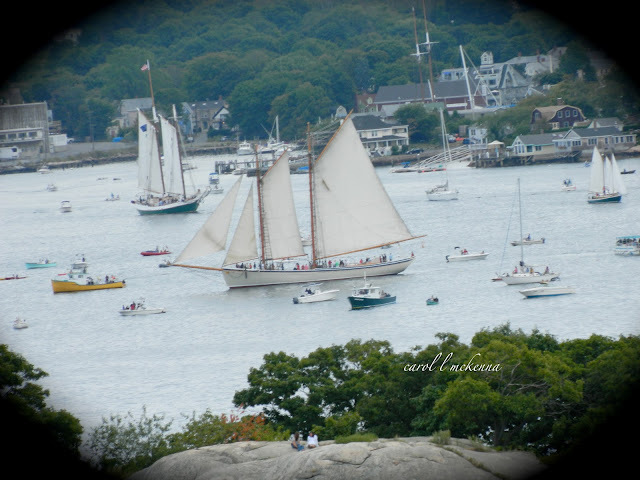 Your schooner festival image is so lovely -- what a treat to watch it from your deck! I like your quote for the day. Have a creative week! Namaste. That first shot is idyllic! When I lived in Virginia I had geraniums sometimes up until Christmas - very resilient flowers. Oh, how I would love to be watching the schooners! The Schooner Festival looks like loads of fun. Have you ever been out on one? that is a very beautiful view. if its me i would probably hanging out there all the time. =) thanks for sharing.. Your photograph of schooner fest is unbelievable. To me, it's like a dream. The quaint village surrounding the water. I would love to visit there one day. Oh wow, these are amazing! Nice! There's so much to enjoy on your blog. What a simply amazing photo of a gorgeous place, a stunning view, and a vintage feel. You have truly captured the essence of this weekend. Of course, the geraniums were an added bonus! Carol, you live in such a beautiful place. How wonderful to be able to sit and view such an awesome sight. I am so glad that you shared it with us. Your Haiku was beautiful and again gave me something to think about. What a wonderful view! The geraniums look great! I love your poem ! Wow! I love that first shot, I think I'd just be lost in a daze watching it. Your flowers are quite lovely as well and I also liked your haiku! Great photos of a beautiful seaside town. The schooners are magical! My Dad used to tell us stories of sailing in ships like that when he was a small boy. Amazing what you have spent the weekend. Lovely images and words from you! Wow, a lovely view. Very nice you are able to watch the schooner festival from your deck. Your geraniums and haiku are lovely. Have a great week ahead. I think there is something restful about watching boats like that! Assuming that its not blowing a gale of course! Love this set of haiku ... well penned on despair. Great pictures also. Thank you for being part in Tackle it Tuesday. What a beautiful photo of all the boats. Wonderful to be able to see it this close. What a great way to spend your weekend! I need to remember that! What a great gift- to have the geraniums return! Terrific captures and a nicely worded haiku. The geranimums are beautiful! As always I love your pictures from the harbor. I love all those boats - that's not something I'll see where I live!